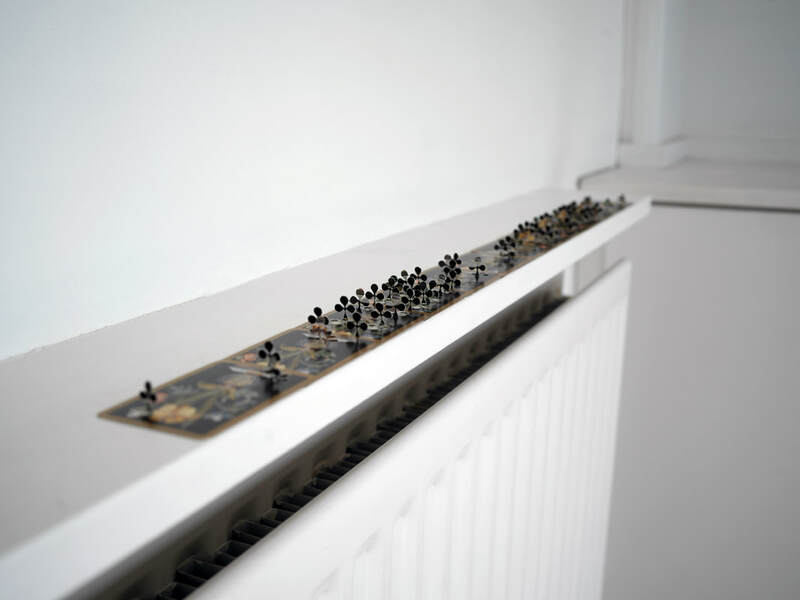 The title of Janne Malmros’ exhibition is Pandesia/Πανδαισία, which means feast or banquet in Greek. Metaphorically it speaks of a rich aesthetic experience and enjoyment. 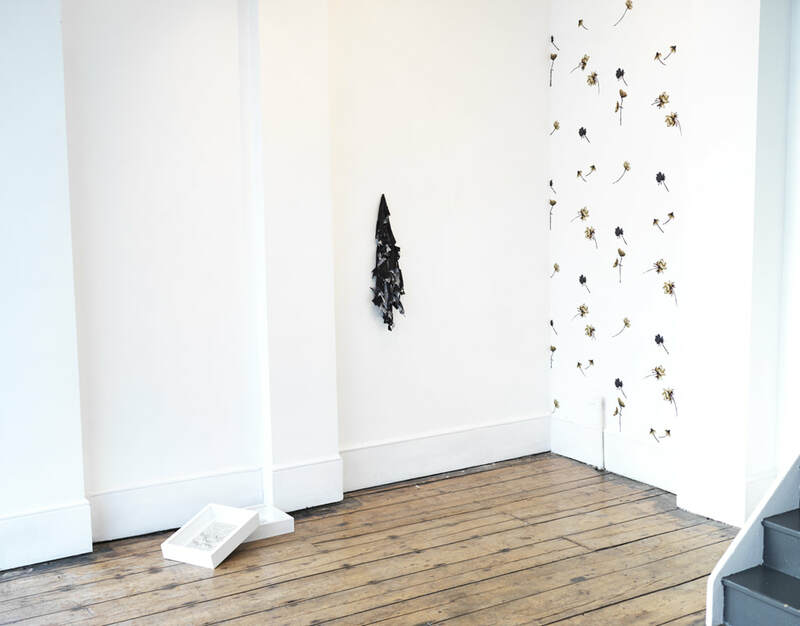 Malmros presents a selection of works, corresponding to her continuous investigation into various materials. All her works are informed by research and a strong interest in botany, the environment, entomology, geometry, history, fashion and pattern. 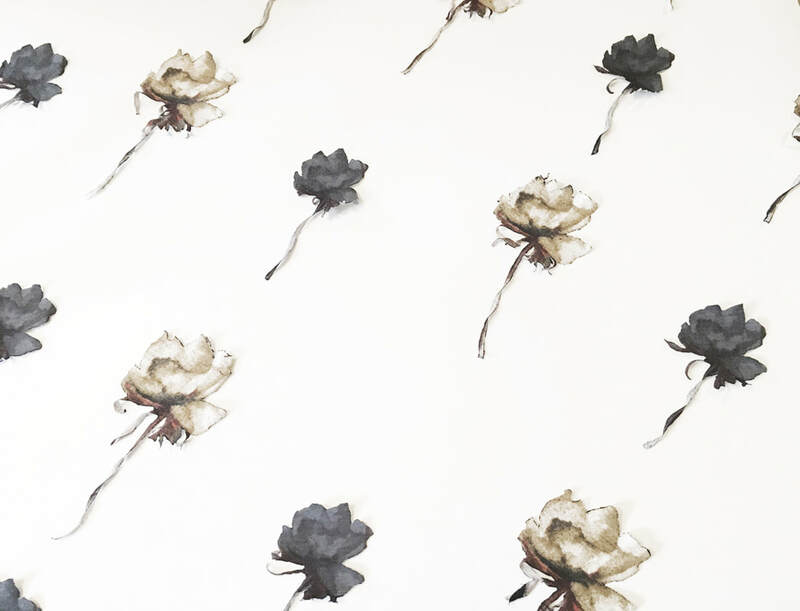 She will exhibit textile works, bronze ginkgo leaves and works using paper. From a distance Wallflower looks like it is moth-eaten, or a torn T-shirt hung against a growing flower pattern on the wall. Set at MOCA, the piece evokes a sense of time and memory. Upon closer inspection, we realise the flower patterns on the walls are carefully cut from the T-shirt. 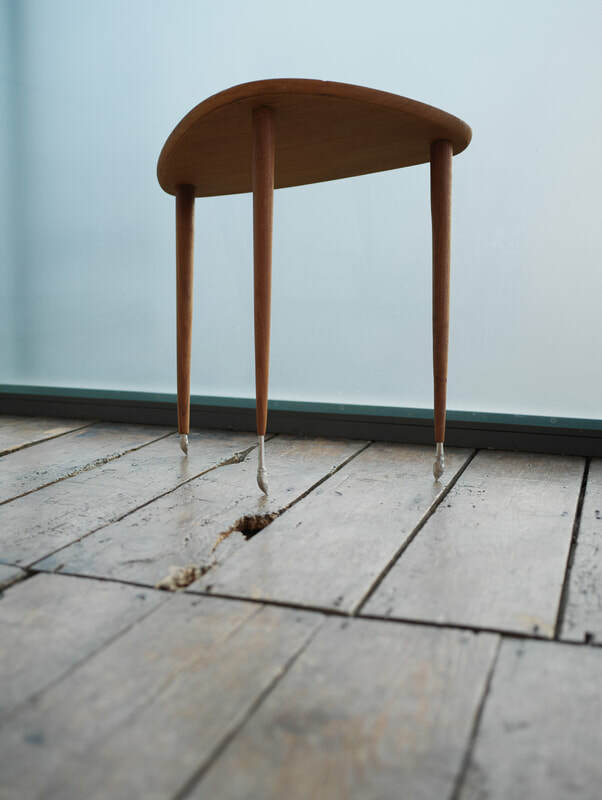 The piece is a gentle architectural intervention that draws our attention to details of the room; the old wooden floorboards, the alcoves and books. The “second skin” we wear daily, or on special occasions, has become part of the walls. Spaces hold memories as does clothing. In many of Malmros' works, as in unfold (part of the Nature Morte exhibition), she cuts out patterns from upholstery or clothing to form new creations. In a way, the works are in a constant state of change, as they become part of the reading of the gallery spaces. Memory, form, and materials are changing, and the repetition of patterns and materials evokes a sense of temporality. There is a playfulness in Malmros' works. She pays attention to discreet objects from the everyday surrounding, and uncomplicated mass-produced products. 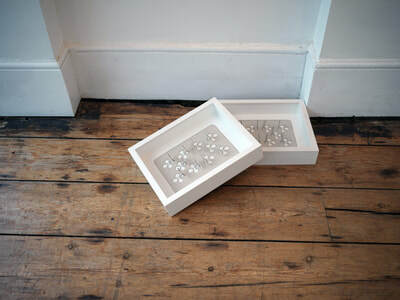 Moreover, she often uses paper in her work, folding it to create a 3D sculptural form out of the paper’s inherent flatness. 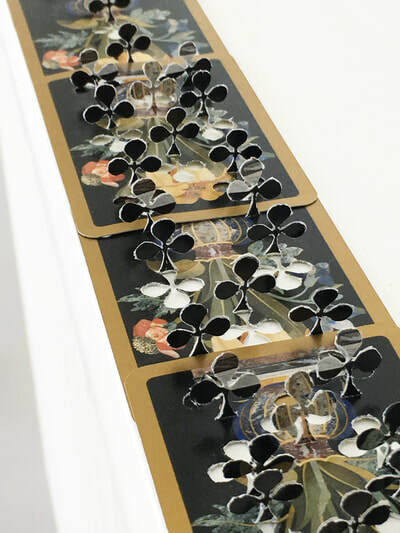 In Scorched, large scale versions of the ten of clubs playing card have been laser cut on cardboard, bent and then placed in two box frames. The objects are abstracted and only the clubs tell which suits it is. 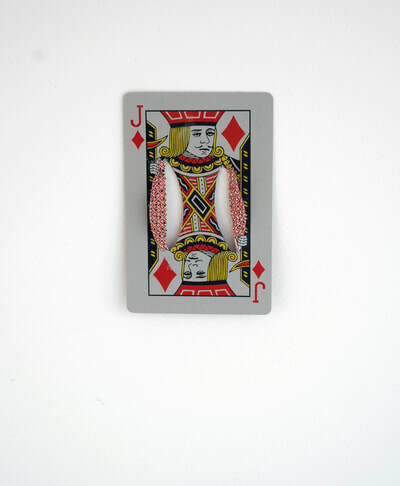 In Burnham Wood she works with the playing cards by carefully cutting parts of the clubs and raising them in the air. Casting shadows they conjure a sense of barren land akin to copses of trees. As with most of Malmros’ works she plays with symbolism. Clubs in cards have a string of symbolism attached to them, they are meant to represent the epitome of the element of earth, summer, youth, health, fire, sexuality and death. 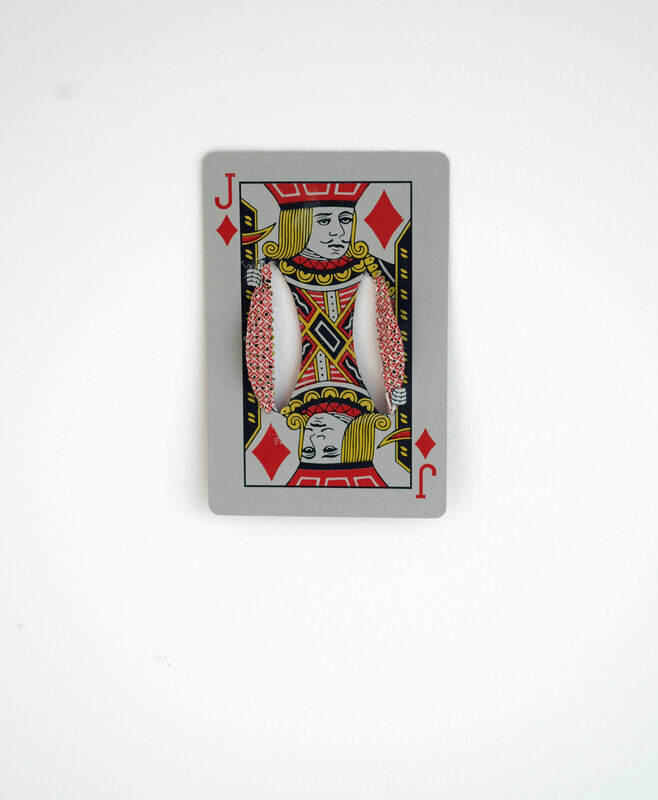 The deck of cards used was bought from the souvenir shop at Rosenborg Castle in central Copenhagen. By changing its forms Malmros altered its function from a social leisure activity to an object of observation. The mimetic depiction of the printed renaissance floral design on the cards becomes its own artefact. It keeps shifting its cultural heritage and meaning between historical representation, to present day alteration of the object, and between the material and the pattern itself. 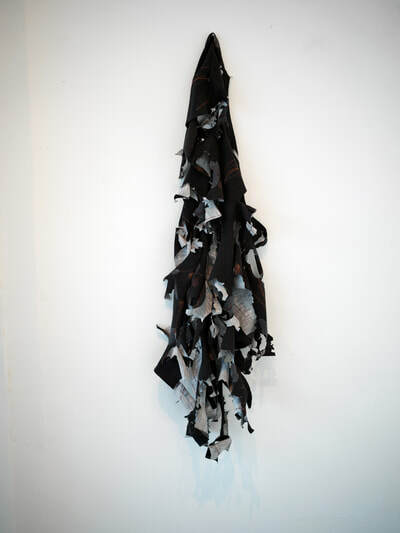 As with Malmros’ other works, she uses her research and the manipulation of materials to question its altered state through time and cultures. Placed on the bookshelf is her Memories of the Jurassic, a small bronze cast of ginkgo leaves. While being small in scale, the bronze leaves hold weight through their botanic and symbolic history. As a symbol of longevity, the ginkgo leaf was often prominent in late 19th-century Asian art and Art Nouveau. Due to their size, we are drawn close to the small sculptures. 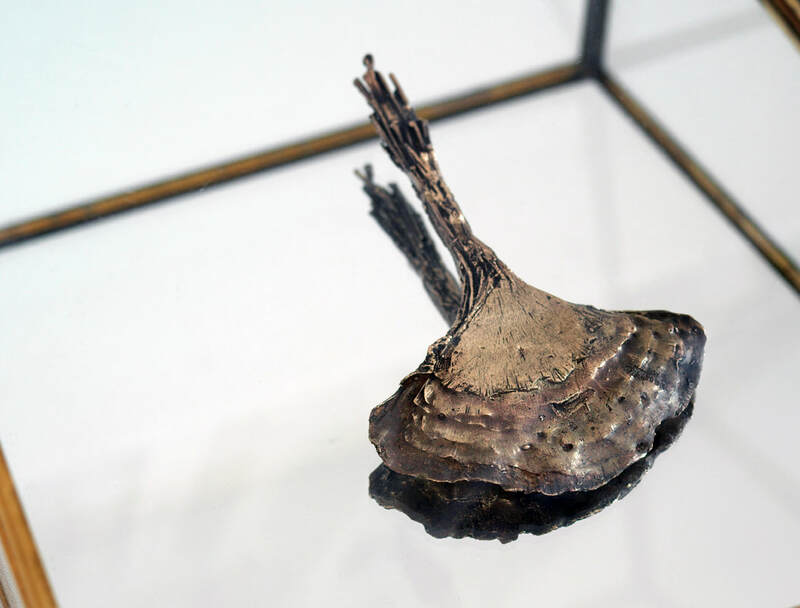 We are reminded that while leaves are a fragile material, by casting them in bronze, they resonate with the resistance of the gingko trees themselves; withstanding both natural and man-made disasters, they are often seen as “living fossils”. Three Ginkgo trees survived the Hiroshima blast and are still growing today. Malmros’ use of repetition, small details, and alterations make us see the value in the things around us, as well as intertwining our physical presence with nature, materials and time.